The International Nestlé Boycott is in effect in 20 countries. The boycott will continue until Nestlé ends its irresponsible marketing of breastmilk substitutes world-wide and abides by the International Code of Marketing of Breast-milk Substitutes and subsequent Resolutions in policy and practice. The Boycott is supported in the UK by over 100 church, health and consumer groups, over 90 businesses, 80 student unions, 17 local authorities, 12 trade unions, 74 politicians and political parties and many celebrities. Who is the 'least ethical company'? Also see the Your Questions Answered section. Click here to download as a pdf file (88 KB). You will need Acrobat Reader to open the file. 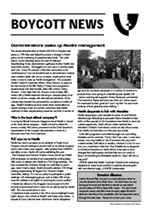 Members receive printed copies of Boycott News and Update newsletters as well as a membership pack. Membership fees are essential for the continued operation of Baby Milk Action. You can join today in the Virtual Shop. Or contact us to receive a free pack of information leaflets (UK residents only). Fans of the comedian and campaigner, Mark Thomas, may be interested to bid for a boycott t-shirt he has personalised and signed (it is a bit rude). This will be auctioned on eBay from 8.00 am on 13th September. The annual demonstration at Nestlé (UK) HQ in Croydon took place on 17th May and helped to prompt a change in Nestlé policy on the marketing of complementary foods. The week before, on the Saturday before the start of National Breastfeeding Week, demonstrators gathered at other Nestlé sites around the country. The biggest turn-outs were in Halifax (right) and York. Every 30 seconds a child dies somewhere in the world because it was not breastfed and so demonstrators marked each needless death with drums, trumpets, anything that could make a noise to wake up Nestlé management. Click here for photo galleries and film clips from the demonstrations. This prompted Nestlé’s Head of Corporate Affairs, Hilary Parsons, to agree to be interviewed on the BBC Radio 4 Today news programme head-to-head with Patti Rundall, Baby Milk Action’s Policy Director. A few days later Ms. Parsons wrote to Baby Milk Action with a Nestlé statement claiming its complementary food labels would now comply with international standards, which indicate they shouldn’t be promoted for use before 6 months of age. Nestlé’s headline promise needs closer examination as reports coming in from around the world show that Nestlé continues to label complementary foods for use from 4 months of age and has launched campaigns in a number of countries to promote these since giving its undertaking (see Update 33). Nestlé has used its presence as an exhibitor at Trade Union Congress annual meetings to present itself as an ethical company and to claim trade union support. After protests from UNISON and other unions, Nestlé will not be exhibiting this year. Nestlé has offered a Fire Brigades Union branch £10,000 towards its benevolent fund in return for an activity day for Nestlé staff. This was turned down in June. 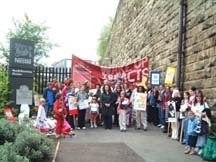 Colombian trade unionists in the UK in June to highlight human right’s abuses were critical of Nestlé’s anti-trade union stance. A boycott of Coca Cola has been called over similar allegations. Health campaigners were amazed at scenes of Lord Richard Attenborough attempting to persuade Nelson Mandela to take half a million pounds for his Foundation from Nestlé in return for a photo opportunity. South African media reported that Mandela's Children Fund charity would not only refuse money from Nestlé, but had done so in the past. UNICEF stated that Nestlé “routinely” breaches the marketing standards for baby foods and that it would be discussing this with Lord Attenborough, a UNICEF Ambassador.
" In a statement it [Mandela's Children's Fund] reiterated the position it took in 2000 regarding a donation Nestle proposed to the Fund. In July 2000 the Fund was approached by Nestle, to contribute towards its Aids Orphan Appeal, a theme it had adopted for Mandela's birthday celebration with the children in that year.
" However given the Nestle debacle in relation to HIV/Aids infected mothers and their campaign on promoting formula milk as opposed to breast milk and the disadvantages they put out publicly regarding breast feeding, the Nelson Mandela Children's Fund declined the donation." Nestlé was active in South Africa throughout the apartheid era, despite Nelson Mandela’s call for sanctions. 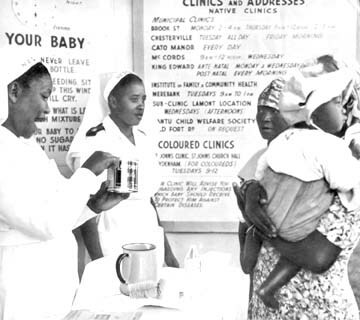 It’s infamous strategies for undermining breastfeeding included ‘milk nurses’ (pictured below, in the 1950s), who promoted Nestlé formula to poor mothers. It is currently promoting its Pelargon infant formula for counteracting diarrhoea (see Nestlé's leaflet by clicking here). A survey by Ethical Consumer Magazine found Nestlé is viewed as the ‘least ethical company’. Nestlé refused to collect the award, so Baby Milk Action presented it to the Chief Executive’s representative at the Croydon demonstration in front of a television crew from Swiss television. Author Richard Platt was put in a moral dilemma when he won the Smarties Silver Book Prize. He didn’t know he was being put forward and decided to donate an equivalent amount (about £750) to Baby Milk Action. We don’t touch corporate money and after much thought judged Richard’s generous donation to be acceptable and not corporate money through the back door. We would appreciate your views. Was Baby Milk Action right to accept this donation? Nestlé Chief Executive Officer, Peter Brabeck-Letmathé, met with Brazil’s new President, Luis Inacio Lula da Silva, earlier this year, offering to donate a thousand tons of Nestlé foods to his ‘Zero Hunger’ programme. Although President Lula has spoken of the importance of promoting family-scale agriculture, Nestlé is providing processed foods, including powdered whole milk. In past decades the distribution of powdered whole milk has had a detrimental impact on breastfeeding rates and infant health as poor mothers sometimes use it for bottle-feeding infants. Nestlé displays its powdered whole milk brands alongside the much more expensive infant formula in the infant feeding sections of pharmacies and supermarkets and, so far, is ignoring calls from Baby Milk Action and others to stop this practice (click here to join the campaign). Nestlé’s attempted takeover of old Brazilian family chocolate business, Garoto, is being considered by the Brazilian competition authorities. In December 2002 Oxfam launched a campaign against Nestlé’s attempts to extract US$6 million from the cash-strapped Ethiopian Government as the country tried to deal with a famine, prompting 40,000 people to protest to Nestlé. It was estimated 11 million people were at risk of starvation. Nestlé criticised Oxfam for launching a public campaign instead of discussing the issue with them in private - a little disingenuous as the Ethiopian Government had been calling on Nestlé to accept a lesser amount for a year. Nestlé’s combative Communications Director, Francois Perroud, gave a radio interview saying it was in the Government’s interest to pay the compensation to earn the trust of transnationals. He did not reveal that it was the Government itself that first offered payment for a nationalisation that had occurred 25 years before, even offering interest. Nestlé disputed the exchange rate being used and wanted four times as much. Following the Oxfam campaign Nestlé settled for the Government’s initial offer and promised to use the money in Ethiopia to alleviate hunger (click here for more details of Nestlé's public relations disaster). It is not yet known if it will follow the same strategy as in Brazil (see above). A video of a recent debate between Nestlé and Baby Milk Action is available for a handling fee of £10 (contact us for details). Nestlé continues to lose. For example, the University of East Anglia held a cross-campus ballot after a debate and the boycott was renewed by a 2 to 1 majority. The Royal College of Paediatrics and Child Health (RCPCH) has voted to allow Nestlé to continue having stands at its annual meetings. Dr. Tony Waterston proposed barring Nestlé to show disapproval of the company’s activities, while Nestlé’s Head of Nutrition stressed the company’s 30-year relationship with the RCPCH. Author Melvyn Burgess contacted Baby Milk Action to check on the latest Nestlé news when he was invited to be a judge for a new Nestlé-sponsored prize for teenage literature. Hearing of Nestlé’s continued malpractice, he contacted other authors who decided to write to the Book Trust, asking it to look elsewhere for sponsorship. Nestlé is no longer being invited to sponsor the prize. Nestlé was noticeable by its absence from this year’s Hay Festival. Germaine Greer, one of those who boycotted the Festival last year was able to take part. On the 21 March Nestlé encouraged people around the country to stop work at 3 p.m. to enjoy a Kit-Kat and a cup of Nescafé. The rest of the world had other concerns: it was the day after hostilities began in Iraq. Baby Milk Action met with the Adam Sampson, new Director of Shelter, following complaints from supporters over Nescafé being promoted on Shelter advertisements. This deal has now come to an end and will not automatically be renewed. Mr. Sampson is reviewing Shelter’s funding guidelines. We will watch developments with interest. Kids Club Network’s Make Space initiative is being sponsored by Nestlé. The campaign provides support to people wanting to provide meeting places for young people. Publicity materials feature the Nestlé logo Nestlé (UK) Chief Executive, Alastair Sykes, is quoted at length in press releases produced for groups. There is nothing to prevent Make Space groups from supporting the Nestlé boycott and displaying posters and leaflets to promote it. Make Space Campaign Director said he would like to receive complaints about the sponsorship to enable KCN to gauge the public mood (for details see the 'sponsorship' section of this website). Nestlé’s press release on its AGM commented on how well it had gone, but did not mention that it was dominated by disgruntled shareholders. This year it was not only the baby milk issue, but Nestlé’s treatment of coffee growers, trade union busting in Colombia and use of Genetically Modified (GM) ingredients in baby foods, despite a promise not to use GM in any products. Families have worked at the Nestlé’s Fulton factory in New York State for generations. Yet Nestlé has closed it down after nearly a century in the name of efficiency. Chief Executive, Peter Brabeck, has overseen cuts in manufacturing costs of US$2.8 billion by “closing dozens of creaky factories” (Time, 3 February 2003). The next time Nestlé suggests the boycott is putting people’s jobs at risk, remember Mr. Brabeck is a Nestlé worker’s biggest threat. If customers in Sweden buy Nestlé products for 300 SEK they get a free ticket to a concert of popular group GES. Boycott supporters have protested at concerts. The group said it would not have entered into the deal if consulted beforehand. Niklas Strömstedt of the group said: "It's awful to be associated with that company." Nestlé is ‘sponsoring’ the UK television programme Pop Idol with £6 million deal. Keep an eye on the voting system to see if you can text or email in ‘Boycott Nestlé’ as your vote. The cancer-charity-linked, Race for Life is sponsored by Nestlé’s Buxton water. We prepared a special boycott leaflet for those wanting to protest while still taking part. Click here for a list of Nestlé (UK) products. Premier Foods also makes Rowntree Jellies, but there is a licensing agreement with Nestlé, so this product remains on the list. The same is true of Lyons Maid products. Though these are now manufactured by Richmond Foods, there is a licensing agreement, meaning Nestlé profits from sales. Nestlé continues to buy up all the water companies it can. The latest to fall is PowWow water - losing its contract to supply the World Development Movement amongst other places as a result.